Lauren LaFreniere throwing shot put. She won the event on Wednesday at Scappoose. 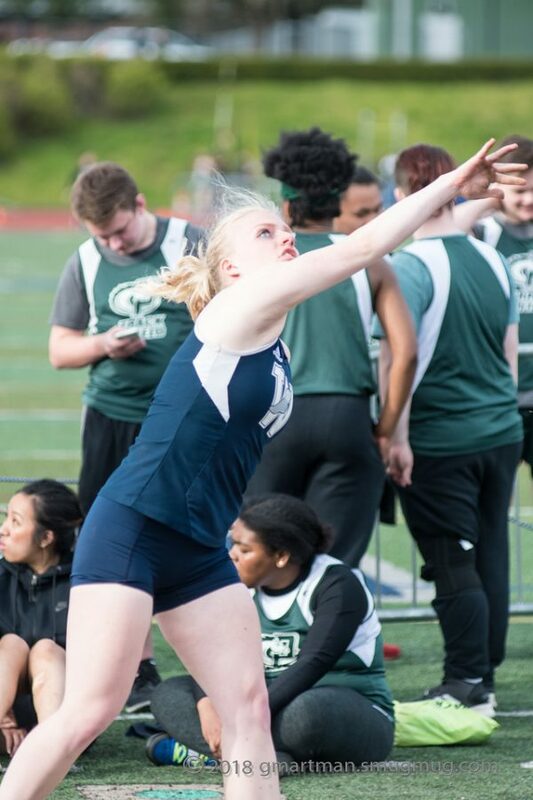 Even without star athlete Jackie Foltz, Wilsonville rallied behind their throwers to outlast the competition. On Wednesday afternoon, the Wildcat track team made the 37 mile trek to Scappoose high school to compete in a three team league meet against the hosting Indians and the St. Helens Lions. With Scappoose joining the Northwest Oregon Conference this season, this meet was the first time Wilsonville had competed against the Indians. And of course, St. Helens provided good competition, as they always do. Wilsonville more than held their own, though. Junior Sam Prusse won the 800 meter dash with a time of 2:26.36, while her younger sister Gabby placed third with a personal best 2:38.42. Gabby also won the 1500 meter race with a new PR of 5:10.95. The girls team continued to dominate the distance races, with senior Angel Bohn winning the 3000 meter and junior Juliette Saccente recording a new PR on her way to third place. The Wildcat girls destroyed the competition in the shot put, sweeping the podium. Senior Lauren LaFreniere placed first, and sophomores Emi Bishop and Madison Jones finished second and third, respectively. Jones put on a show in the discus as well, winning first place with a new personal record throw of 106’10”. In the javelin, the Wildcat girls secured the top three spots, with junior Kayla Hieb winning the event and seniors Delaney Dougherty and Teagan McNamee close behind. On the boys side, Trevor Johnson won the 800 meters dash and posted a new season best time. All three of our 1500 meter athletes finished with a new PR, and senior Jack Burns led the way with a time of 4:16.29, which was enough for first place. Burns also placed third in the 3000 meter race, behind two impressive Scappoose athletes. In the shot put, Wilsonville dominated, finishing first through third. Senior Mike Church won the event with a throw of 49’8.5”. Freshman Kellen Hartford won the high jump, tying his personal best with a jump of 5’8”. The freshmen boys proved successful in the long jump, with Rocco Marshall winning the event and Hartford finishing second. At the end of the day, the Wildcats stuck to their strengths: distance and throwing. Based on the results from Wednesday, as well as the two meets prior to this matchup, Wilsonville has a talented team with particular strength in these areas.